This autumn chicken pot pie recipe is not your typical comfort food. 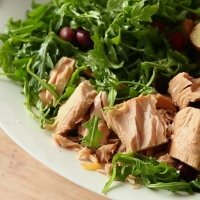 With sweet cranberries, tart apples, veggies and of course the chicken, your taste buds will be alive with lots of different flavors. This main dish is a bit more involved than others, so make sure you schedule enough time to get this one done right. While the time involved is longer, this is not short on taste and umm umm goodness. Warm up tonight with this chicken pot pie for dinner. Add a tossed salad and some corn bread for the sides to compliment this dinner idea. In a large bowl, combine flour, ginger, lemon zest and salt. With a pastry blender (or 2 knives), cut in 1/3 cup butter until mixture is coarse and crumbles. Sprinkle 3 tablespoons of water over the dough mixture and toss with a fork. The dough should be just barely moistened, enough to hold together when formed into a ball. Add more water if needed. Form the dough into a flat disk and wrap in plastic and refrigerate. Drop pearl onions into boiling water for 30 seconds; drain, peel. Steam pearl onions and carrots until tender. In large saucepan over medium heat, melt 2 tablespoons butter. Whisk in flour and ginger until smooth. Reduce heat to low and gradually whisk in chicken broth. Stir in pearl onions, carrots, apples, cranberries, lemon juice and chicken. Let simmer for 5 minutes, stirring regularly. Spoon filling into 6 individual pie dishes. On a lightly floured surface, roll dough out flat. Using a bowl (or dish slightly larger than the pie pan), cut out 6 circles. Lay the dough over the top of each pie dish. Trim and crimp edges. Use a small knife to cut several slits in the center of the chicken pot pie. Set the pie pans on a baking sheet and place in the oven on the middle rack. Reduce heat to 400°F and continue baking for an additional 20 minutes or until pie bubbles around edges and top is nicely browned. The chicken breast, apples and veggies were not used to calculate SmartPoints. The dried cranberries are included. The veggies and apples were not used for the other points. 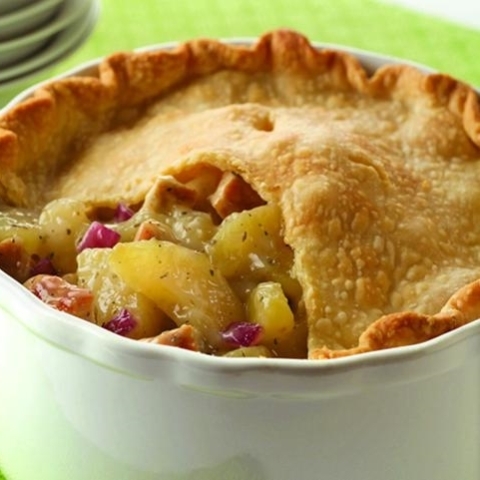 You can use ready made pie crust if you want instead of making your own as this chicken pot pie recipe does take a lot of time and effort. Here's another seasonal chicken recipe. This summertime chicken salad is one of my favorites. I can't wait until the weather changes and we have fresh fruits available. Stuff yourself (and the chicken breast) with this recipe idea. 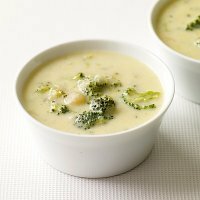 This makes for a creamy delight for lunch or dinner. 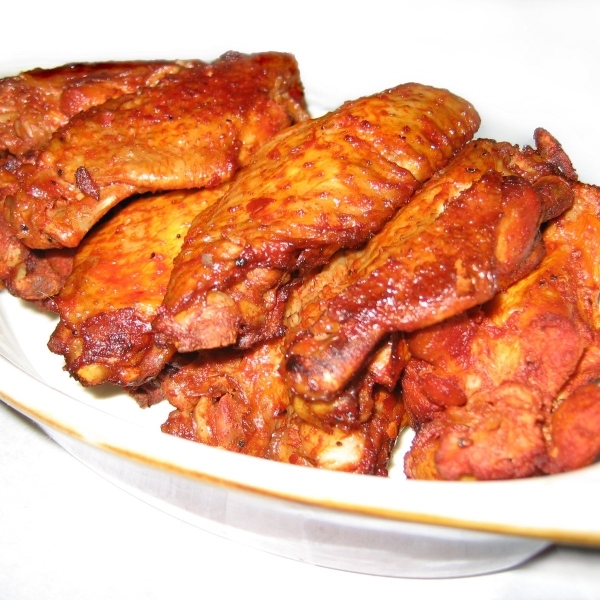 Spice it up with these Sriracha chicken wings. Use them as an appetizer or eat them as the main course. 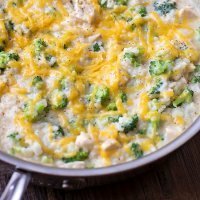 This creamy chicken rice and broccoli recipe is cooked in a skillet which saves you time and dishes. Is it dessert, a snack or even breakfast? You decide when you want to eat this healthy all fruit (no ice cream) treat. Here's another comfort food that will warm up your taste buds and keep you feeling satisfied. 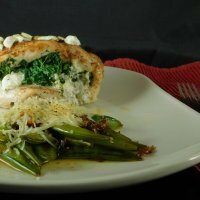 The zesty flavor of the lemon French dressing that is part of this recipe is a delightful surprise. Here are some tips to help you reduce the fat and calories in the foods you cook. By learning to change some cooking methods you can be eating healthier and losing weight. Food labels can be confusing at times. Don't let all that information get the best of you. Learn how to understand food labels by checking out this article. Are you pondering Free styling your diet? Be sure to check out Weight Watchers new zero point foods and why these items made the list.